Under the watch of the business community, Atlanta grew from a railroad terminus to an essential production hub for the Confederacy and a tempting target for the Union armies. The city grew faster than even its greatest boosters could have imagined, but war, slavery, and economic pressures left many in dire situations. Then, after having been devastated by fire, illness, and economic collapse at the end of the war, Atlanta rebounded. Atlanta’s business community had taken a bet on secession – believing it would bring the most economic benefit to them and to the city. That bet is the story of A Changing Wind – it would change the lives of men and women, blacks and whites, parents and children in ways that no one could have expected. Was it a good bet or a disastrous one? The answer is hardly simple. A Changing Wind is a rich and complicated story of the people who determined the rise, fall, and ultimate rebirth of this vibrant and changing metropolis. Venet shows that to understand Atlanta’s early history, we must recognize the significance of a variety of ambitious speculators—entrepreneurs, politicians, soldiers, benevolent reformers, consumers, and slaves—who built, tore down, and rebuilt an urban social order. . . . [A Changing Wind] deserves a wide readership. A solid account of the city’s experience, as told by the residents themselves … The deep immersion into the day-by-day unfolding of the Civil War in the Gate City showcases Venet’s skills as a narrative historian. And although we know the outcome of the struggle, her depiction of the panicked city injects a sense of contingency and urgency rarely found in historical accounts of the Civil War. 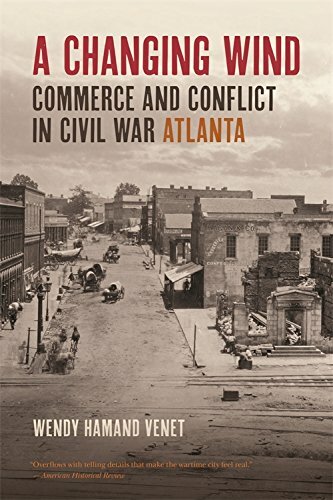 This deeply researched, informative book provides a panorama of Civil War Atlanta, one admirable for the author’s inclusiveness and marshaling of telling details. An entertaining narrative that evocatively places readers in the midst of Civil War–era Atlanta. This is quite an accomplishment. Wendy Venet takes the reader deep into the vibrant life of a young Atlanta, tells the story of how it became a burned and hungry place, and draws into one compelling narrative the diverse and competing voices of those who refused to let Atlanta be gone with the wind.